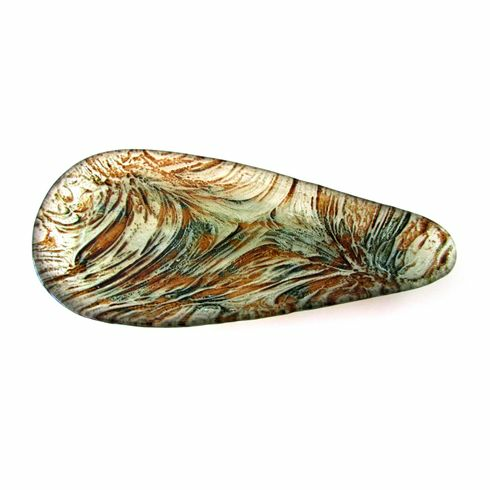 You can use this piece of art plate as a decor piece on your coffee table, coin tray, jewellery tray or even a soap dish in your bath. You can also serve small bites of food as dessert, appetizers, cheese etc... in this bowl to decorate your table at your dinner party. Good size to serve nuts or personal tasting dishes as well. You can also use as a candle plate for your pillars. Try to combine this tray with the Ballad Mini Bowl for serving any appetizer that comes with a dipping sauce, as a personal chip&dip tray or serve sushi with your soy sauce served on the mini bowl.